"At times, some people get confused, thinking that the commandments are restrictions or limitations that complicate life, that take away opportunities or happiness or the pleasures of life. 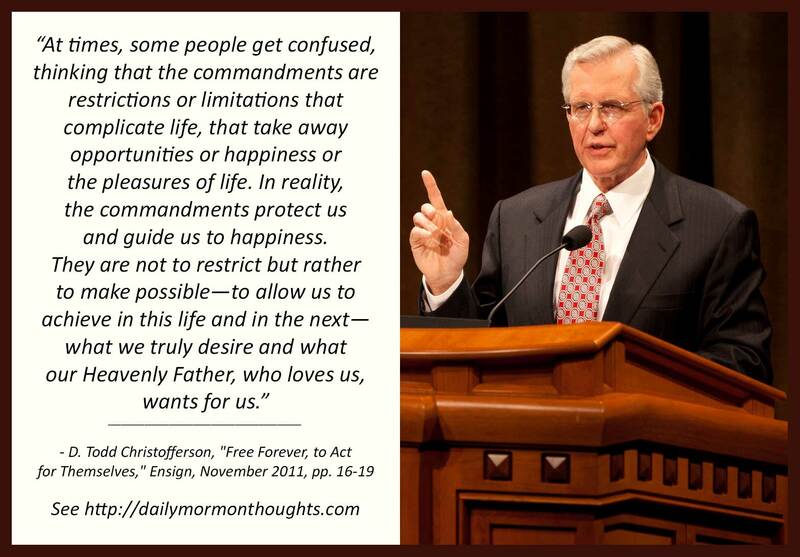 In reality, the commandments protect us and guide us to happiness. They are not to restrict but rather to make possible—to allow us to achieve in this life and in the next—what we truly desire and what our Heavenly Father, who loves us, wants for us. "They are like a flight of stairs. Each step may represent one commandment, and with each commandment that we obey, we can move upward. 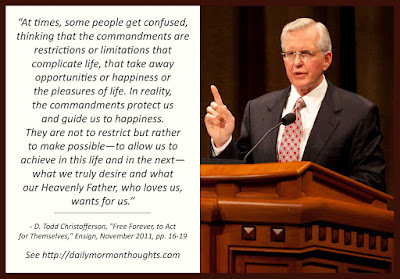 Then, if we understand the essence of the commandments, we want more. 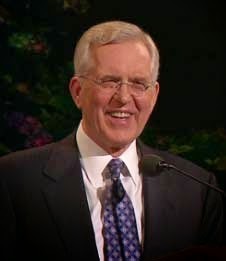 We don't feel resentment regarding the commandments; we want more in order to be able to progress more. And a Heavenly Father who loves us gives unto us according to our desires. If we desire it, He is going to give us more commandments in order to facilitate our progress." I have witnessed in others, and experienced myself, the attitude Elder Christofferson describes relating to commandments. They can be viewed as restricting, controlling, limiting. But that is a very naive and short-sighted approach that shows only a lack of understanding. When properly understood in the broader context of our eternal lives, commandments provide a framework of happiness, enabling both safety and progress. I like the analogy of a flight of stairs. Each act of humble, conscious obedience raises us a little higher. Each step upward increases the desire to continue to climb. And in fact, each act of obedience makes it easier to obey as we continue; both our ability and our desire grow as we continue in the ascent towards our ultimate goal. How blessed we truly are to have been given these divine guidelines to assist us in finding peace and joy!